Economists, political scientists, sociologists, and entrepreneurs from 30 countries gathered at Moscow Economic Week Wednesday to discuss the state of the global economy. Sponsored by Moscow State University, the forum titled The crisis of market fundamentalism in Russia and worldwide – birth of new guidelines also examined Russia’s current economic challenges and possible solutions. “The venue has been chosen for a reason,” said the Viktor Sadovnichy, the Rector of Moscow State University. “As all the flowers grow at this university, so will the forum present different points of view,” he added. 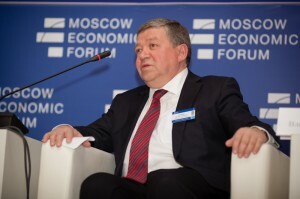 Ruslan Grinberg, director of the Economy Institute of the Russian Academy of Sciences, began by outlining how Russia’s economy changed since the fall of Communism. “There is no longer a deficit, no queues outside shops. We have achieved significant progress. But there are problems as well, and they should be solved. Economic policy should be changed,” he said. When the discussion turned to the problems facing the global economy, forum delegates suggested various ‘remedies’, but many were contradictory in nature. “We have to insist on producing account surpluses,” said Alfred Gusenbauer, former Chancellor of Austria. “Over the decades social justice was an additional political goal in addition to economic efficacy and GDP growth. But now things have changed. Now, social justice is a fundamental pre-requisite for economic success, because social justice essentially means that there will be additional demand that is more widespread and distributed,” Gusenbauer said. Grzegorz Kolodko, the former deputy prime minister and finance minister of Poland, approached the challenges from the point of view which stressed that today’s crisis is embedded in the problems of neo-liberal capitalism. “And neo-liberal capitalism is the capitalism of speculators. It has no future, but it is being fought for,” he added. Kolodko, who is also credited with reforming Polish economics, believes that the crisis has manifested itself in four different spheres of daily life. It started in the financial sphere, spreading to the real economy, followed by the social sphere, and finally spilling over into the political sphere. He says the result is that the world is now facing a crisis of ideology. Many experts agree with Kolodko’s analysis adding that the world should come up with a new approach to the new challenges instead of resorting to outdated mechanisms. “Business as usual would be a major mistake you can do now,” said Kolodko. But Immanuel Wallerstein, a professor at Yale University, believes that a market economy is not synonymous with capitalism; rather he believes that the two are opposing forces. “Market economy means buyers, sellers and information. So they can’t make much money. While capitalism is a pro-state economy that needs to suppress market economy for quasi monopoly,” Wallerstein said. Gusenbauer agrees. He believes that capitalism starts where market economy ends. The need to properly define and re-define common knowledge comes as a pre-requisite of the global economic future. Global economic measurements, such as GDP or the Gini index – which measures the degree of inequality in the distribution of family income – are no longer relevant. As the economy shifts, new paradigms become necessary. In today’s market realities, it much more relevant to speak about employment or unemployment. On the left side of the debate Alexander Buzgalin, professor of economics at Moscow State University, believes market capitalism does have a future. “There is no market capitalism today. The key word is today… Choosing where to go – to debts and inflation or to neo-liberalism; there is a third option – you can change the system of production, [make] it more efficient and [ensure] just distribution,” he said. The trouble of today’s situation is that it is impossible to predict what happens next and there are no short-term solutions, as each patch on the global financial system makes the wound even worse. “We shouldn’t look for an ideal model that could solve the troubles,” says Alexander Nekipelov, Vice-President of the Russian Academy of Science.